No one would talk on Wednesday at the eight-story apartment in Macau's old quarter where Kim Jong-nam lived with his family and at a high-rise condominium in another part of the territory where he also had a unit. The condo is just five minutes from the international school once attended by his son Han-sol, now 23, and daughter Sol-hui, now 18. Kim moved to the condominium around 2008 to make it easier for his children to attend the school but moved in 2011 because South Korean residents had found out where it was after Han-sol brought home a South Korean girlfriend. There were no signs of the family anywhere. Han-sol last year said he was heading to Macau as he left France, where he studies. But South Korean expats there said they have not seen him recently. Sol-hui, who graduated from school last September, has also not been seen. One friend of the family's said, "I tried to call Jong-nam's wife after learning about his assassination on the news last night, but her mobile phone was turned off. They probably had an action plan in case something bad happened to him." When asked about the possibility of Jong-nam's family defecting to South Korea, the friend said. "North Korean agents can't do whatever they want in Macau, which is Chinese territory. Macau may have been safer than South Korea." A condominium in Macau where Kim Jong-nam lived with his family (left) and the Facebook account believed to be Kim Jong-nam's. According to people who met Kim in Macau, he settled there around 2002, entering on a visitor visa and later gaining citizenship. One person said Kim regularly frequented three or four Korean restaurants and went to the casinos. He did not smoke but drank one to two bottles of soju or 10 shots of boilermakers in one sitting. Another, who spotted him in a sauna, said he had a dragon tattoo on his stomach and chest. Until his father Kim Jong-il died in December 2011, Jong-nam traveled widely throughout Southeast Asia and even to Europe. When Kim Jong-il suffered a massive stroke in August 2008, he flew to France and brought back neurologists to Pyongyang. But after his younger half-brother Kim Jong-un executed their uncle Jang Song-taek in December 2013, he became more reclusive and limited his travels to Southeast Asia, apparently because his allowance from Jang had been cut off. His first wife Shin Jong-hui and a daughter live in Beijing, and there are rumors that he has mistresses in Malaysia, Singapore and Indonesia. He always flew alone but showed up with female companions when dining in restaurants across the region. "Kim Jong-nam had a bright personality, but he grew depressed after Jang Song-taek was executed and often said 'life is so sad' and expressed dismay at how his uncle was killed," the family's friend said. A North Korea source said Kim made a lot of money by running a trading business with North Korea with the help of Jang Song-taek. "The execution of his uncle and benefactor must have been a huge shock." 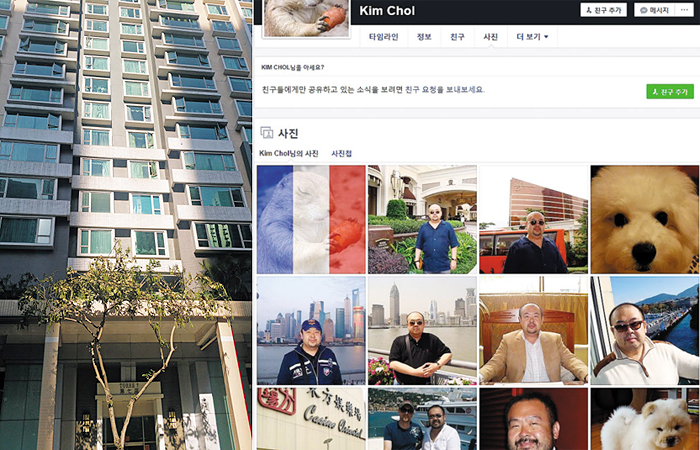 Meanwhile, Voice of America reported that Kim had a Facebook account under the name Kim Chol, which was linked to Han-sol's and had 164 friends. Among around a dozen photos, some appear to have been taken in Macau in 2010.